Despite worries about the island’s recovery from Hurricane Irma, stricter U.S. travel regulations, and a mysterious ailment that affected American and Canadian diplomats, Cuba is still expected to eke out a record travel year in 2018. When all the numbers are tallied, Cuban officials expect that the island will have received a record 4.75 million international visitors with Canada and the United States the two leading markets. Although that falls short of an ambitious target of 5 million foreign visitors, it’s still 1.3 percent ahead of the 2017 record. But the Cuban travel industry began the year inauspiciously. During the first half of 2018, the number of international visitors was down by 5.67 percent and the number of travelers from the United States, excluding Cuban Americans who are counted in a separate category, plummeted by 23.6 percent compared to the first six months of 2017. Bookings began to increase during the usually slow summer season and by year’s end U.S. arrivals had recovered, according to Cuban tourism officials. Visits by Americans are expected to be up by around 1 percent in 2018. Still, that’s far from the booming growth in U.S. travelers to the island by Americans after former President Barack Obama and Cuban leader Raúl Castro announced a rapprochement between the two countries in December 2014. Cuba, however, wouldn’t have achieved any growth in international visitors if it weren’t for a 48 percent spurt in cruise ship arrivals. Cruise lines, most of which depart from the United States, have added dozens of itineraries that include stops in Cuba and by the end of 2018, cruise passenger arrivals are expected to reach 850,000. Currently, 25 cruise ships from 17 international companies call in Cuba, Tourism Minister Manuel Marrero said Wednesday evening on the Mesa Redonda television program. Another category that showed brisk growth in 2018 was visits by Cubans residing abroad. More than 585,600 members of the Cuban diaspora visited in 2018, a 17 percent increase over the previous year. But while both cruise ship and diaspora arrivals pushed the number of international visitors into positive territory, both categories tend to represent lower revenue for government coffers because such visitors don’t stay in hotels or eat as many of their meals in restaurants. But that trend was partially offset by a 35 percent increase in hotel stays by Cuban nationals, who once were barred from hotels and resorts frequented by international visitors. Just over 1 million Cubans stayed at least one night in a hotel in 2018, said Marrero. At least some of them, however, were Cuban hotel workers. Travel analysts and Cuban officials chalked the low initial 2018 numbers up to fears that Cuba hadn’t recovered from the ravages of Hurricane Irma that raked the island’s north coast in September 2017, and confusing U.S. travel regulations under the Trump administration. Even though Cuba made hurricane recovery in tourism areas a priority and had completed most repairs by November 2017, the blow from Irma came at a time when many travelers were booking winter vacations and it scared them away. “Although the destination was ready in November for the beginning of the high season, the perception of the damage caused by the meteorological phenomenon continued for many travelers,” said Marrero. Then confusing U.S. travel restrictions and advisories made American travelers think twice about visiting the island last winter season. New regulations designed to keep U.S. dollars out of the hands of the Cuban military went into effect in November 2017. They barred Americans from carrying out direct financial transactions with 180 companies, including 83 hotels, that are controlled by Cuba’s military. Last month, the U.S. State Department updated the restricted list, adding 30 more entities controlled by the Cuban military. Nineteen hotels — including the recently opened Iberostar Grand Packard Hotel, Havana’s second five-star hotel, and the Havana Paseo del Prado, a hotel that is still under construction — were added to the list. Many of the hotels on the list are on the resort keys off Cuba’s north coast, which don’t attract many American travelers because the United States prohibits trips by Americans whose sole purpose is tourism, but a number of Old Havana hotels that were popular with Americans are on the list. Perhaps taking a bigger toll was a Level 3 travel advisory issued by the Trump administration after diplomats posted to the U.S. Embassy began suffering from a mysterious ailment whose symptoms included ringing in the ears, balance problems, fatigue, nausea and cognitive difficulties. To date 26 American diplomatic personnel have been confirmed to be suffering from the syndrome, most after hearing strange sounds or pressure on the skin in their residences and three Havana hotel rooms. It’s still unclear what caused the incidents or who might be responsible, but it was enough for the State Department to tell American travelers to reconsider trips to Cuba. On Aug. 23, however, the State Department softened the travel advisory on Cuba from a Level 3 to a Level 2 (exercise caution), a move that some travel operators say gave Americans more confidence to travel to the island. “I was well aware and read a good deal about what happened at the embassy and the speculation as to the ailments,” said Ralph Williams, a Californian who arrived in Cuba on a recent cruise. But he said the incidents were isolated to diplomatic personnel. “I didn’t give it a second thought” when making travel plans, Williams said. A dozen Canadian diplomats and family members also suffered similar symptoms but it wasn’t until this past April that the Canadian government declared its Havana embassy an unaccompanied post, meaning family members could no longer accompany diplomats. That was months after the U.S. had declared its embassy an unaccompanied post. Worries about hurricane damage at the resorts frequented by Canadian tourists, as well as the health incidents, also took a toll on Canadian travel to Cuba. 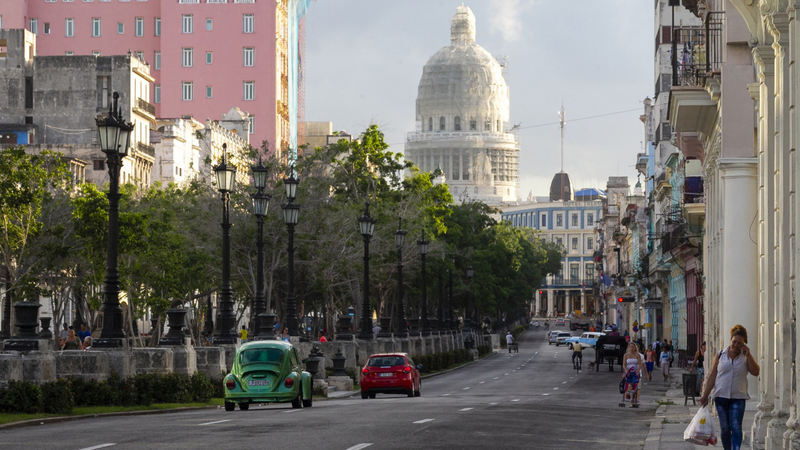 Canada was still Cuba’s top international market in 2018, but the number of Canadian visitors fell to 1.1 million, a 2 percent decline. At a recent press conference, Michel Bernal, the Tourism Ministry’s commercial director, said the Canadian market was expected to rebound in 2019. The target is 1.3 million Canadian visitors, which would equal a record set in 2015. In general, he said, recent trends have been “quite encouraging.” The target for international arrivals in 2019 is 5.1 million, which would represent 7.4 percent growth over 2018.